Chhachhrauli is a small town located in the Yamunanagar district of Haryana, India. This city got its name from the word “Sat Sherawali” which is originally a temple situated there. It comprises of a Gram Panchayat which has total 20 wards in it. This small town serves as an important place in history by being the capital of the significantly huge state of Kalsia. There is a famous fort called as Chhachhrauli Fort which is constructed by the Raja of the Kalsia Estate. As the former capital of Kalsia state, Chhachhrauli initially consisted of two tehsils, i.e. Dersbasi and Kalsian. These two tehsils are now can be found close to Chandigarh and Amritsar respectively. Before independence, Kalsia state had an important place in the eight states of Punjab, but later in 1947, these states merged as the newly formed PEPSU (Patiala and Eastern Punjab Union). Then it was merged with Punjab and later became the part of Haryana in 1966. 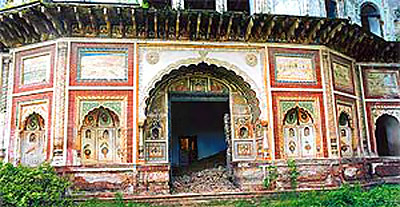 The historical fort of Chhachhrauli served as the residence for state departments and an important place for Darbars, executive meetings and other significant occasions. But now the Fort is not in much good state as it got destroyed during the history. Also, this city is surrounded by the famous Gurudwara of Paonta Sahib, mythical Kapal Mochan and the popular and frequently visited Panchmukhi Hanuman Temple. It was said that after getting victory in the war of Kurukshetra, the five Pandava Brothers visited here and worshiped at this town in the famous epic of Mahabharata. Chhachhrauli is exactly located at the meridian position of 30° 15' 0" North, 77° 22' 0" East. Also, this town is very close to the borders of Uttar Pradesh, Himachal Pradesh and Uttranchal. This place captures the land area of about 3,287,263 square km. An important grain market is situated at this place which serves as the centre for the nearby located villages like, Singhpura, Sherpur, Chuharpur Khurd, Urjani, Yaqub Pur, Dasaura and Pipli Majra. All the farmers from these villages come here for selling their farming produce. This place mainly remains warm and temperate throughout the year. Also it gets abundant rainfall during the winter rather than in monsoon. Also, it records an average temperature of 24.0 °C and an average rainfall of 1326 mm. During the sunny month of June, this city experiences the highest temperature of around 32.7 °C and the coldest time comes in January having an average temperature of 13.7 °C. Also, the slightest amount rainfall is recorded during April having an average of 7 mm and most amounts are recorded in August with an average of 416 mm. So, talking about the best time to visit this place will be during the rainy season of August or one can visit it in the chilly month of January. Having a total population of 10,533, this town comprises of 52.49% of males and 47.50% of females. Children under 6 years of age constitute 10.55% of the whole inhabitants. Coming to the literacy rate, this town has an average 84.79% in which 89.20% males are literate and 79.98% are literate females. Chhachhrauli has an ancient Fort known as Chhachhrauli Fort that was built by the Raja of Kalsia state as mentioned before. Talking about the other attractions near the place, these are Kalesar National Park (15km), Balasundari temple, Trilokpur (63km), Fossil Park Saketi (40km), Hathni Kund (20km), Bhudia (10Km) and Bilaspur & Kapalmochan (8km). These nearby places are frequently visited by the travelers all around the world. So, now we are going to provide you with the important information of this place in the following section. Chhachhrauli is known for its beautiful Chhachhrauli Fort which is now in a very bad condition. Many years ago, Chhachhrauli Fort was given to the administration of Chhachhrauli by the Kalsia Family, whose state’s Raja has built this finely made fort. Painted by the murals, this fort had the beautiful paintings of flowers and the modern views of things like, churches and Europeans. But later it was built into two schools, the law courts and municipal offices. And after the interior paintings of the Fort start to be deteriorating and thus it is left in a very bad state now. The Yamunanagar administration has announced many schemes to improve the quality of the Fort and is under consideration. There are various tourist places situated nearby Chhachhrauli and are a must visit on a trip to the historical town of Chhachhrauli. Bilaspur & Kapalmochan are an important religious site. Bilaspur was given its name after Maharishi Ved Vyas who wrote the Indian epic Mahabharata because he used to stay in an Ashram located here on the bank of a pond. Also, it is known as a historic place because there is statue of Uma Mahadev which was said to be made in 9th-10th century, and a statue of Lord Ganesha said to be built in 11th-12th century and also one can found here the remains of Gupta period which tends to verify the antecedence of the city of Kapalmochan. There a holy Kunds (Ponds) like Rinmochan, Kapalmochan and Surya kund where people bathe and experience the feeling of holiness. The next nearby place is the town of Bhudia which is said to be a historical site. Rang Mahal situated here give the evidence that Humayun made it when he visited the Shivalik Forests while hunting and this place also have a connection with Birbal one of the important jewels of Akbar. Kalesar National Park, one of the finest wildlife parks of India, is also a frequently visited place for wildlife enthusiasts and there is a Dak Bungalow which is said to be 100-year old. Hathni Kund, around 20 km from Chhachhrauli, is a center of flowing Yamuna waters from different places of Haryana. Here, the major attraction is the thrilling river rafting to Gurudwara Paonta Sahib, camping and trekking in the nearby Forest of Kalesar. Fossil Park Saketi has a famous museum illustrating the fossils of the animals and creatures that used to live here many centuries ago. The famous Balasundri Temple has its own ancient legend when the Devi’s pindi was foung in a slot by a local trader and thus the temple was made in 1573 by the Raja Deep Parkash of Sirmour. Thus, these are the nearby sites that are a must see on a trip to Chhachharuli. Chhachhrauli currently has only one Government hospital in it which provides the town folks in medical emergencies and also it serves on reasonable prices. Yamunanagar Health Department has been trying over years to invite some of the private hospitals managements to build their infrastructure at this place and also the Haryana administration has been consistently working to construct some more hospitals in Chhachhrauli in future. As a part of highly cultural and traditional Haryana, the folks at Chhachhrauli celebrated almost all the festivals throughout the year with joy and splendor. These festivals include, Gangore, Teej, Janamashtami, Diwali, Holi, Dusshera, Lohri Baisakhi, Guggapir, Mansa Devi Mela and many other Indian festivals. To reach Chhachhrauli, one has to first reach Yamunanagar. Yamunanagar is well linked to both rail and road networks. Also, the nearby airport is Dehradun Airport which connects to almost all the main cities of India. The railway stations reaching Yamunanagar are Jagadhari, Jagadhari Shop and Saharanpur. Being an agricultural hub for farmers, Chhachhrauli only provide its residents with some of the necessary utility services. There are four banks and a sub post office located in this small town and the Police station of Yamunanagar serves this city. The administration at Yamuna Nagar is consistently working to improve the status of utility services here in future. Being a not so well known place for travelers, Chhachhrauli has its own historical importance. And places like, Chhachhrauli Fort and the nearby historical Gurudwara of Paonta Sahib, mythical Kapal Mochan in Bilaspur and the well known Sankat Mochan Temple, all these are a must visit on a trip to Haryana. So a weekend trip to this historical place will fill your mind with the glory of ancient India and the beautiful sites nearby will just make your trip a worth visit. The Haryana Tourism Department is also planning many strategies to improve the interior infrastructure of the Chhachhrauli Fort in future.